When I started to grow alpines many years ago I was not a great fan of woodland plants, but that changed since my first visit to China. I fell in love with the Cypripediums which I saw. 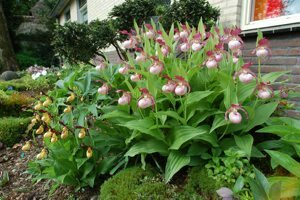 I was very lucky to receive some seedlings of various Cypripedium species and grew these on to flowering size in 4-6 years. I made a special area in my garden for these plants. There was also some space for other plants and I planted different species of Trillium, Roscoea, Arisaema, Podophyllum, Sanguinaria, Corydalis, Anemonella, etc.My soil is a mixture of leafmould, well rotted pine bark and pine needles, some pumice and a small amount of fibrous loam. This mixture is very airy. 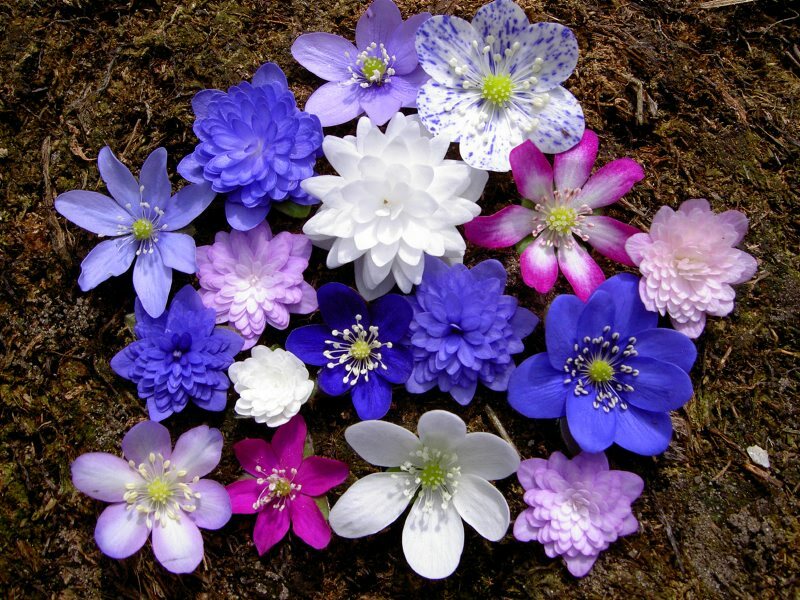 I also have planted several Hepatica forms between the other plants. 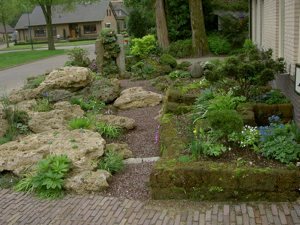 When I visit the Gothenburgh Botanical Garden in Sweden some years ago I was very impressed by their walls made out of peat blocks. In these peat blocks they planted Shortia and they looked very healthy and flowered all very well. When I had to rebuild my front garden a few years ago I decided to make also a part of this into a woodland garden with an area made out of peat blocks. In the first year the wall is looking very “fresh” but then moss will start to grow on it. I have planted many plants directly in the peat blocks. The big advantage is that it is much easier to plant a peat block then tufa! Plants which grow very well in the peat blocks are species of Shortia, dwarf Rhododendron, Pernettya Pearls, autumn Gentians, Diapensia, some Asiatic Primulas, Gaultheria, etc. I also tried Pleione in various forms with many of them together. Every year they get better. In winter I just put a sheet of bubble wrap over them to keep the winter wet off. Other plants which grow well in the peat blocks, but need some winter protection are various cushion plants like Androsace delavayi, A. lehmanii, A. tapete, Raoulia x loganii and Myosotis pulvinaris. My little treasure on the peat blocks is the pink flowering Diapensia purpurea, which goes well but did not flower for me so far. Try to get the soft peat blocks which are pale brown in color. Do not use the black, hard ones! Or use a chemical called “Mogeton” made by Bayer. 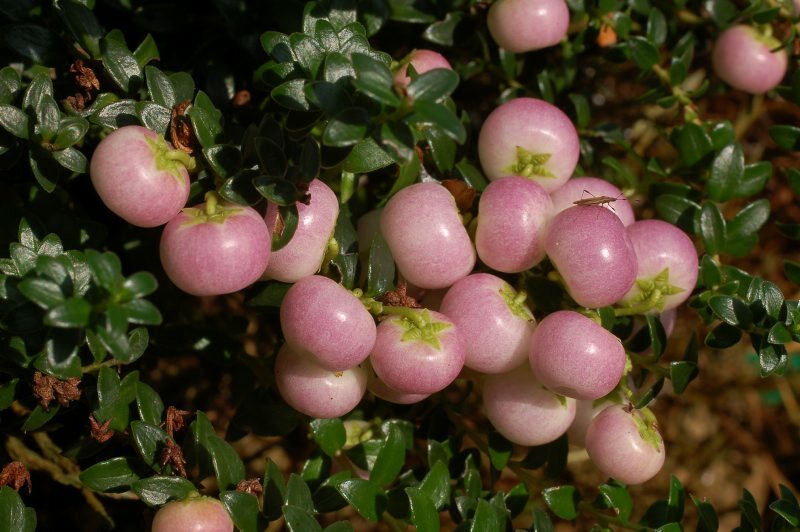 (Active Ingredient 25% Quinoclamine) It is expensive, but works reliably.